Professional offices along Cheltenham Avenue in Cheltenham, one of several areas in the Delaware Valley encompassing Greater Philadelphia that has a significant Korean population. In the background is the northern terminus of Broad Street. Upper Darby Township is another area where there are significant pockets of Korean people and commerce, at Fairfield Avenue and Garrett Road. The first Philadelphia Koreatown (Hangul: 필라델피아 한국 도시) was located in the Olney section of the city of Philadelphia, United States. 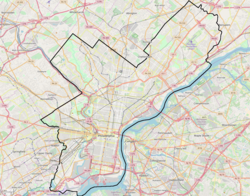 Since the late 1980s, the Korean community has expanded northward, and it now straddles the border between North Philadelphia in Philadelphia proper and the northern suburb of Cheltenham, although many Korean-American businesses and organizations and some residents remain in Olney and adjoining neighborhoods. Upper Darby Township, bordering West Philadelphia, also has a large Korean-American population; meanwhile, a rapidly growing Korean population and commercial presence has emerged in nearby suburban Cherry Hill, New Jersey since 2010, centered along Marlton Pike, attracted to the Cherry Hill Public Schools. Signage in Hangul (한글) is ubiquitous in some neighborhoods in these areas. According to the Philadelphia Inquirer, the Koreatown had "moved" from the Logan neighborhood into the Olney section in the early 1980s, attributing the migration from Logan to "too much crime" and the "schools weren't so good" at the time in Logan. In Olney, tensions were high between Koreans and the German community, as well as the black community, who did not want the section of the town to be officially declared "Koreatown", causing much violence and crime to be committed not only against Koreans, but Asians in general. The original Koreatown existed on North 5th Street in Olney since 1984, with Korean language signs put up to help official recognition of the area; those signs were vandalized in the late 1980s. Today, that section of town has transitioned into the Puerto Rican neighborhood call El Centro de Oro. View towards Market Street PA route 3, across from H-Mart, at Terminal Square. The 69th Street Transportation Center is also nearby. ^ a b Jae-Hyup Lee. Dynamics of Ethnic Identity: Three Asian American Communities in Philadelphia. ^ "ACS DEMOGRAPHIC AND HOUSING ESTIMATES - 2009-2013 American Community Survey 5-Year Estimates - Cherry Hill township, Camden County, New Jersey". United States Census Bureau. Retrieved April 26, 2015. ^ "Profile of General Population and Housing Characteristics - Cherry Hill township, Camden County, New Jersey - 2010 Demographic Profile Data". United States Census Bureau. Retrieved April 26, 2015. ^ Richard Manfredi, Demand Media. "Korean Restaurants in Cherry Hill, New Jersey". USA TODAY. Retrieved April 26, 2015. ^ a b Marc Kaufman (July 13, 1986). "'Koreatown': From Logan Into Olney". Philadelphia Inquirer. Retrieved April 26, 2015. This page was last edited on 6 December 2018, at 21:16 (UTC).